There are three main types of sleep apnea: Obstructive (caused by relaxation of throat muscles and narrowing of airway), Central (caused by the brain improperly sending signals to control breathing), and Mixed (a combination of the two). 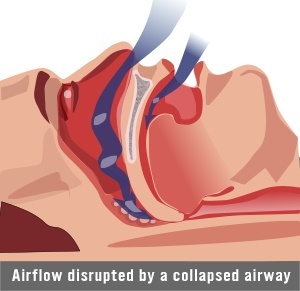 Upper Airway Resistance Syndrome is a sleep disorder similar to Obstructive Sleep Apnea, where the airway collapses or reduces to restrict breathing. Follow the links below to find out more about the different types of Sleep Apnea. Obstructive Sleep Apnea, or obstructive sleep apnea syndrome, is the most common form of sleep apnea. Although normal sleep sometimes includes small amounts of obstructive sleep apnea (OSA) and its symptoms, individuals who experience chronic OSA often go undiagnosed, especially if they sleep without a partner. OSA affects individuals of all ages, ranging from mild to severe and can easily worsen if not left undiagnosed or untreated.What Causes Obstructive Sleep Apnea? Not to be confused with central sleep apnea, obstructive sleep apnea occurs when the throat muscles relax during sleep and restrict breathing by collapsing or narrowing the upper airway. Old age, brain injury, and decreased muscle tone are commonly believed to be at the root of OSA, although individual cases vary. It is also correlated with obesity, abnormal nose/jaw/mouth features, and complications with certain throat or larynx surgeries. Just like any other muscle in the body, the throat is inclined to relax during sleep. However, the throat is lined with soft tissue and it is the collapse of these soft tissue walls that obstruct breathing in OSA. In non-chronic sufferers, this could be caused by nasal congestion, tonsillitis, or the influence of substances that are designed to relax muscles or prolong sleep. Like any other sleep apnea, OSA is characterized by snoring and irregular breathing during sleep. Obesity is not always present, but a typical individual carries upper heaviness, especially in the neck. Excessive daytime sleepiness is the primary signifier of an adult with OSA. Insomnia, sleep deprivation, and teeth grinding are all both effects and symptoms of OSA. In children, however, symptoms don’t always include excessive daytime sleepiness. Instead, be wary of restlessness, hyperactivity, and loss of appetite. Children who also experience stunts in growth should be checked for signs of sleep apnea. Obstructive sleep apnea in children is often a byproduct of engorged tonsils rather than heaviness, although children who are overweight may experience OSA similarly to their adult counterparts. Please visit our page on treating sleep apnea for extensive information on OSA treatments.